Please join the Golden community in providing a safe and memorable After Prom Party for our students. 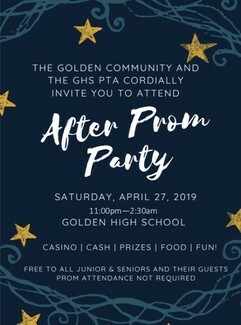 All Junior and Senior students are invited to attend the party April 27, 2019 11:00 pm - 2:30 am at Golden High School - even if they do not go to Prom. There is no cost to attend After Prom! It requires resources from our entire community to pull off this fun and memorable event, so please consider how you and your family can help make it happen! Prepare cafeteria for decorating, remove posters, rearrange tables, hang lighting. Small and large ladder work. We'd love to borrow your off season lighting system! Please clearly label yours with name and phone number or email address. Drop off Saturday between 9 and noon. I have four lights total. I have three high quality lights that cast off specks of light like stars. Green, red, blue. I also have one solid green spotlight. I will bring them when I come to decorate on Saturday. Hang lights in trees, post signage, and set out luminary bags. Small ladder work. Decorate indoor areas, hang lighting, set tables and post decorations. Small ladder work. Do I need to bring table cloth, coffee thermos, table decor? or do you have? Prep and decorate the auditorium. Prep and decorate the gym. Large and small ladder work. Set up and decorate photo booth. Keep the fun happening in the Auditorium. Monitor exits, walk students to cars and maintain safety.